LASIK surgery (laser-assisted in-situ keratomileusis) is a popular refractive surgery procedure offering improved eyesight for millions. A condition called "LASIK dry eye" has become a fairly common side effect that can cause, in some individuals, extreme eye discomfort. With wise pre-operative and post-operative precautions, the risk and severity of LASIK dry eye during LASIK recovery may be reduced. Patient satisfaction for LASIK surgery is between 92-98 percent and the risk of infection is greater from wearing contact lenses than from LASIK complications. The incidence of post-LASIK dry eye six months following surgery is 36%. Untreated dry eye symptoms, caused by a loss of natural water in the eye's protective tear film covering (the tear film should contain 99% water) can compromise or diminish LASIK surgery outcome. In a small percentage of patients, post-LASIK dry eye is severe, permanent and untreatable, causing chronic pain and eyesight impairment. .
Keep weight under control (a lean person's body is about 70% water while an obese person's body can be as low as 40% water). Increase intake of "eye foods" (dark green leafy vegetables, omega-3 fatty acids and carrots). 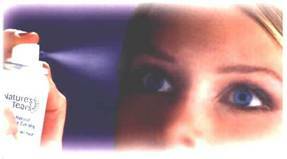 Increase natural tear film water content by misting eyes several times daily with an all-natural hand-held eye mist (Nature's Tears EyeMist). 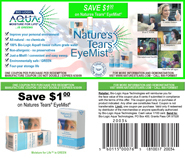 Maintain the natural tear film water enhancement and anti-dry eye program, including regular application of Nature's Tears EyeMist, for at least six months following surgery. If you maintain the program forever, your eyes will me more likely to remain healthy, comfortable and well functioning.